GANT is a brand with astonishing heritage, GANT takes its name from founder Bernard Gantmacher, a Ukrainian textiles worker who arrived in New York in 1914, and launched his own company with his wife following the end of the first World War. GANT were the first mens shirts to feature a locker loop on the back, and the collar button tab was also first seen on GANT items. Where can I check my GANT giftcard balance? You can check your GANT giftcard balance online at their website, by clicking here. You can also check the balance on a GANT giftcard by handing the card to a member of their team at any GANT store in the UK. Click here to find your nearest GANT store. (Note that the cards can only be spent at stand-alone GANT stores (and stand-alone GANT outlet stores, they cannot be spent in concessions of department stores). Where can I buy a GANT gift card? GANT gift cards are available for sale in amounts from £10 to £1000 directly from GANT’s website, by clicking here. GANT gift cards are available to buy from any GANT stand-alone store. Click here to find your nearest GANT store. Note that giftcards are not available to purchase in outlet stores but they are accepted as payment. Where can I spend my GANT gift card? 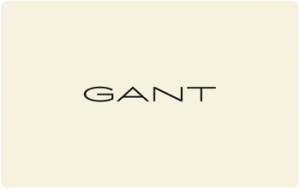 You can spend your GANT giftcard at any of GANT’s stand-alone stores, including outlet stores. They can’t be used in GANT concessions in other department stores. You can also spend them on GANT merchandise online, at the GANT Website.